One of the first responses from the AMD community when we posted our story about the power draw concerns on the new Radeon RX 480 was to point out that apparently the ASUS GeForce GTX 960 Strix card had a similar issue. Keep in mind that the GTX 960 reference specifications put the TDP of this product at 120 watts, 30 watts lower than the RX 480, though it still utilizes a single 6-pin power connection in addition to the motherboard supplied power. I have an ASUS GTX 960 Strix so I wanted to see if the claims made were accurate. I fired up our advanced power testing hardware this morning and ran through the worst-case tests we had come up with over the last 48 hours, including running Metro: Last Light at 4K in both stock and overclocked settings. At stock clock speeds under Metro: Last Light at 4K, the total power draw on the GTX 960 Strix card never exceeds 110 watts, motherboard supplied power never exceeds 30 watts and the 6-pin PCI Express power cable never exceeds 80 watts. This is interesting - even though the 6-pin cable is technically rated at just 75 watts, ASUS decided that rather than draw more power over the motherboard interface it would prefer to depend on the over-built power delivery of the power supply itself. I decided it crank things up slightly by adding in the maximum voltage increase to the card through Precision X software and then setting the GPU clock offset to +93 MHz. The resulting total power increases to over 115 watts, while the motherboard power increases to nearly 35 watts and the 6-pin power cable jumps to peaking at almost 85 watts. Zooming in on the power data shows us a very stable, low variance power delivery system on the GTX 960 Strix card. 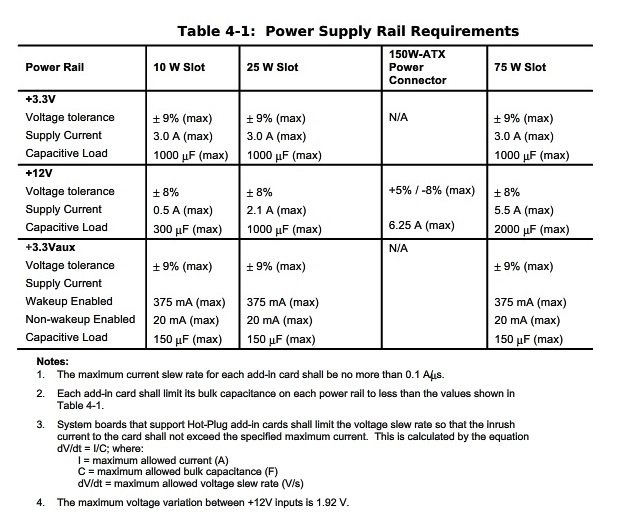 Again, it is worth noting that the 6-pin power connection is definitely drawing more than the 75 watts that it is technically rated at, but that the motherboard +12V power delivery is still well within the defined 66 watt limit we discussed earlier. Just as another data point, here is some captured power delivery with Rise of the Tomb Raider with the GTX 960 Strix card in its overclocked state. Total power draw doesn't exceed 105 watts and the power through that PCI Express slot on the motherboard stays at 30 watts or less. With our ability to measure voltage and current, we return back to Metro: Last Light at 4K to find that amperage draw over the motherboard's +12V line stays right at 2.5A. That is a drastic difference compared to the RX 480 hitting more than 7A over the same line, especially considering the 5.5A limit from the PCI Express specification. We are still working with AMD to learn about the solution to this power problem and I hope to have an answer later today. For now, we are looking around the office for some older, less expensive systems and motherboards to use to try and duplicate any system failures (shutdowns, etc.) that we have been reading about online.